The snow-covered virgin hills of Nelliyampathy will blow your mind for sure. The quaint setting of Nelliyampathy makes it a dream destination for romantic vacationers and solitary wanderers. 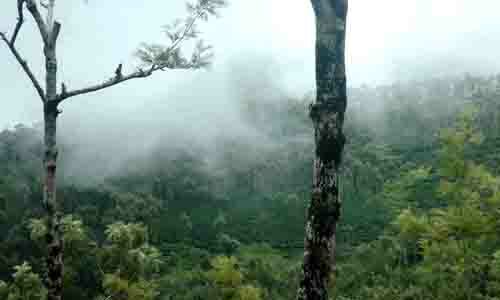 Despite, Nelliyampathy is an alluring hill station setting the vista for a great hill station tour. Renowned for its orange cultivation, tea, coffee and spice plantations, bio-farming, elegant fauna, lush green forests, misty mountains and spectacular valleys, Nelliyampathy fascinates tourists from various parts of the world. The trekking trail in Nelliyampathy is very famous that it draws many adventure enthusiasts to this hill station. The Parambikulam Wildlife Sanctuary is a must visit place in Nelliyampathy. It is home to a variety of rare animals like Nilgiri Tahr, Nilgiri Langur, Wild boar, Lion Tailed Macaque, Bonnet Macaque, Langurs, Red Big Wild Squirrel, Wild Gaur, Civet, and Spotted Deer. From the top of the Pothundi Dam, you can enjoy the astounding view of the emerald green Nelliyampathy valleys. Capture some amazing photographs of the bird's eye view of this beautiful land as a remembrance of your journey to Nelliyampathy. You can even try adventure activities like Paragliding, Paramotoring, and Tandem Flights. Nelliyampathy is a chief place for shopping good wine as well as fresh and organic items. So, don't forget to shop wine and organic items from Nelliyampathy. Go for a winsome picnic at the romantic hill station of Nelliyampathy. The virgin hills of Nelliyampathy. Spot rare animal species at Parambikulam Wildlife Sanctuary. Enjoy spectacular aerial views from the Seetharkundu Viewpoint. The picturesque rock-cut garden, Malampuzha Gardens. The famous Shimmering Pothundi reservoir. Don't forget to carry woolen clothes and shawls during your trip to Nelliyampathy. September to May is the best time to visit Nelliyampathy. Summers (March-May) are not too hot and is favorable for travelling. The temperature ranges from 20°C to 33 °C during this season. Nelliyampathy remains drenched during the monsoon months of June to September. Hence, the monsoon season is not recommended for visiting Nelliyampathy. The winter season of November to February is the best season to roam around this place. By Air : Coimbatore International Airport is 118.6 Km away. By Train : Palakkad Railway Station is 62 Km away. By Road : Nelliyampathy is well- connected to major cities like Trichur, Guruvayoor, Cochin, Calicut, Kottayam, Trivandrum and Tamil Nadu. You can get fresh coffee and tea leaves from the Tea & coffee plantations in Nelliyampathy. Nelliyampathy is renowned for its orange gardens. You can get fresh oranges from here. Handloom products and handicrafts made from wood are also available here. Processed fruit products like jams and squashes are sold at the Government farm office.